Hey remember that one governor that said he was hiking in the woods but actually flew to Argentina to be with his mistress? Been wondering what that guy’s been up to? Winning Congressional primary elections apparently. 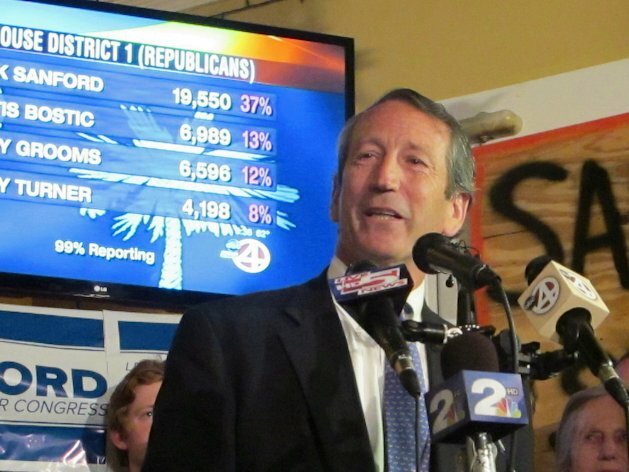 Former South Carolina Governor Mark Sanford easily got the most votes (37% vs. Curtis Bostic’s 2nd place 13%), though he needed at least 50% to avoid a runoff. The top 2 Republicans (margins are tight but it is looking likely Curtis Bostic will join Sanford) will vie against each other in a runoff 2 weeks from now on April 2. As for the Democratic primary side of this special election, no runoff election will be needed as Elizabeth Colbert Busch easily won with 96% of the votes (she faced minimal competition while the Republican side had about 16 candidates). If that name sounds familiar it’s because Colbert Busch is the sister of Stephen Colbert. The special election was triggered when the former Representative of the 1st Congressional District was named to take the Senate seat vacated by Jim DeMint (get all that?). The general election will take place May 7 and it’ll be interesting to see a (probably, but not guaranteed) former governor tainted by an affair go against the sister of a popular satirist-comedian.